Lancaster House befindet sich im Herzen von Baltimore pulsierenden Fell Point historischen Viertel. Während den Charme eines 200-plus-jährige Zuhauses, das dreistöckige Stadthaus wurde mit modernen Annehmlichkeiten komplett aktualisiert. Materialien gehören Eiche, Schiefer, und Keramikböden, Baldwin Messing-Hardware, Edelstahl-Zähler, Williamsburg Farben und kundenspezifische Gehäuse. Inklusive Wohnküche mit hoher Decke und Dachfenster, Dachboden mit Blick auf Küche, einen privaten Innenhof mit Essbereich und Gasgrill, Keramik-Fliesen Bad mit Dusche aus Glasbausteinen, Wendeltreppe, und viel Charme. 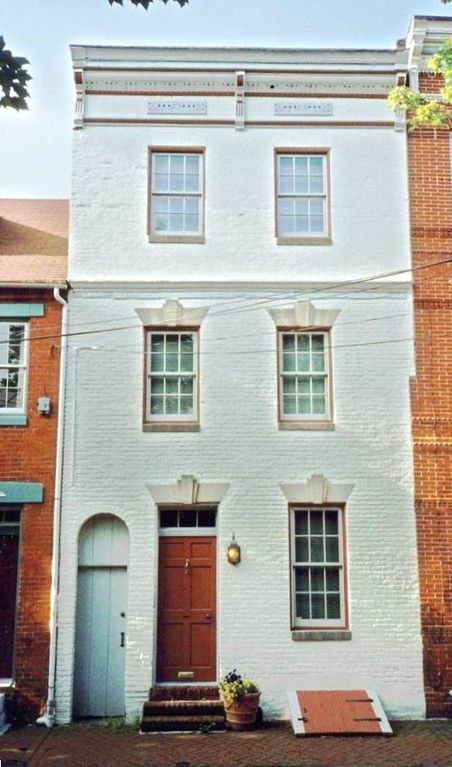 Die National Register Historic District von Fells Point ist eine spannende maritime Gemeinschaft mit vielen sorgfältig restaurierte, aus dem 18. und 19. Jahrhundert errichteten Gebäuden. Die Kopfsteinpflasterstraßen sind am Leben mit Restaurants, Tavernen, Theater, Kunstgalerien, Antiquitäten und Vintage-Kleidung Geschäfte und andere einzigartige Einrichtungen. Plus, es ist nur einen kurzen Spaziergang oder dem Wassertaxi zu den vielen Sehenswürdigkeiten von Baltimore berühmten Inner Harbor fahren, und zahlreiche Restaurants Little Italy. Fells Point ist der ideale Ort für die National Aquarium in Baltimore erkunden, das Maryland Science Center, Harborplace, ESPN Zone, Federal Hill, Fort McHenry, Oriole Park in Camden Yards, Ravens Stadion, usw. Auch Washington, DC ist nur eine Stunde entfernt und New York beträgt drei Stunden nördlich. HINWEIS: Mehrere vorherige Gäste haben in ihren Bewertungen erwähnt, dass wir ihnen kostenlose Wassertaxi-Pässe gegeben haben. Wir bedauern, dass wir diese Annehmlichkeit nicht mehr anbieten können. Das Wassertaxiunternehmen wechselte den Besitzer und die neuen Besitzer bieten keine übertragbaren Jahreskarten mehr an. Die neue Richtlinie schreibt vor, dass Jahreskarten mit dem Namen des Inhabers bedruckt werden müssen und dass nur diese Person den Ausweis verwenden darf. We (three academics attending a conference) stayed at Lancaster House in May. The house was perfect for our needs - clean, well appointed, and in a funky neighbourhood with lots of good restaurants nearby. We were able to either walk to the convention center or take the water taxi - which was a real pleasure. The house has good internet connection and plenty of space to work in. We would definitely choose to stay here again. I will definitely stay here again. Had a really great weekend. The house has everything you need and really lets you feel like you are part of the neighborhood. It exceeded my expectations! My family and I rented Lancaster House to attend a wedding in Baltimore. We took the water taxi to the reception. The hotel that everyone else was staying at was within walking distance so we could attend the after party easily. We saved a good amount of money renting the house instead of staying at the hotel. The house sleeps 6 easily. The beds are comfortable. One room is a loft that overlooks the kitchen. We were able to walk pretty much anywhere we needed to go. We took the train to D.C. Wish we could have spent more time out in Fell's Point but did have a good meal at the Admiral's Cup. Note that the stairs are a converted spiral staircase that can be slippery! Parking was also a challenge for those who are not used to city parking. Will stay again if we were heading back to Baltimore. Thanks Richard! My group and I really enjoyed our stay! The house had plenty of space for a group of 6 with comfortable sleeping arrangements, spacious shower and a great outdoor seating area. The location was perfect for both daily activities and fun nightlife! Would stay here again in a heartbeat. Thank you Richard for sharing your home with us! We were over here from England for a family wedding and the reception was in Fells Point. The house was in the perfect position with easy access to restaurants, bars, shops and the harbour as all in walking distance. I had never rented a house before but this was just right for 3 of us though there was room for more. Richard was wonderful and patient answering all my queries beforehand as I was slightly nervous about renting. The house was very comfortable and cosy and we had everything we needed. It felt like a proper home not just a rental home. Not only did Richard leave a welcoming vase of flowers but he had kindly bought a few goodies for which I had requested and would not take payment which was so kind of him. He was also able to offer another house for us to rent for our children which was a 5 minute walk away which belonged to a friend. Again a fabulous house. We would definitely recommend renting Lancaster House. Thank you Richard. This is our second time returning to the Lancaster House and will we surely be back again. We had a mix of kids and adults with us (6 total), and the place was perfect and comfortable for everyone! The interior has a fun and welcoming personality and my husband and I enjoyed the courtyard out back with a bottle of wine during some down time. The location is perfect and it truly has felt like a home away from home for our family. The property owner, Richard, has kindly accommodated our needs and we have especially appreciated the complimentary parking pass and water taxi passes. That saved us a lot of money on our trips! In addition, I did not realize my 7 year had left some things behind and Richard shipped them back without my asking. Our family definitely recommends this place for either a family or couples getaway! !